The circuit near Rome named after Piero Taruffi will house this coming weekend the penultimate act of the Italian Formula 3 Championship and the newly born Italian Formula 3 European Series. The challenge is tight on top of the charts for the Prema Powerteam pair made by Cheever – Maisano and for JD Motorsport's driver from Padova Agostini. 12/09/2012 - Engines of the Formula 3 Dallaras and Mygales are still warm after the round of Imola but now the game is getting hard with one month to go to the end of the season. The top three drivers of the charts will have further motivations for this round: Cheever will be racing on the home track at Vallelunga, Maisano will have to countercharge after the weekend of Imola and Agostini will fight to get back the penalty points he was issued after the exclusion from Imola's race one. The three musketeers are ready for the challenge in the two series with the intervention of some top class outsiders such as Kevin Giovesi, confirmed behind the wheel of the team Ghinzani's Dallara, and ready to repeat the double victory of Imola. Important comeback in the ranks for the team from Bergamo, as Robert Visoiu ended the GP3 season with the 14th place in classification. The Brazilian of Prema Powerteam Henrique Martins, winner in Imola, will be part of the contenders too in a season full of ups and downs where he managed to collect three wins and two second places. At team BVM , the home hero Mario Marasca, will be sided by an old friend of ACI-CSAI formulas: the Swiss Michael Heche, that ended on the lower step of the podium of the Italian and European Formula Abarth Series last year. The seventeen years old Swiss is at the debut in Formula 3 will try to challenge since the beginning the top drivers of the series. Team Euronova is also ready to get back on the podium with the driver from Moscow Sergey Sirotkin, twice on the third step of the podium in Imola and still in the fight for the rookie title with Henrique Martins and Riccardo Agostini. The Japanese Yoshitaka Kuroda will be at his side. JD Motorsport confirmed the Canadian Nicholas Latifi on the side of the Mygale of Riccardo Agostini. Latifi has been galvanized by the first podium in the debut season on a single seater. 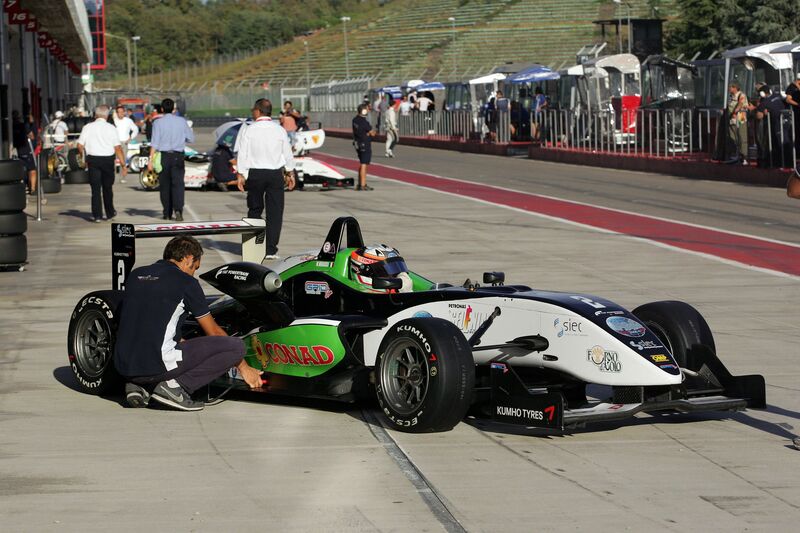 The North-American driver made huge steps forward and will try to confirm his progress in Vallelunga. The South African Roman De Beer (Victoria World) will be absent instead. The Roman weekend of the Formula 3 will start tomorrow with 4 hours of collective tests. On Friday one free practice session of 30 minutes is scheduled starting from 13.10 (GMT+2). Saturday morning qualifying will take place at 09.10, followed by the first race of the weekend on 22' plus a lap at 15.10 (live on Rai Sport 2 and web streaming at www.acisportitalia.it). Sunday will be quite instead as the longest race of the weekend will begin at 10.00 with live coverage on Rai Sport 2 and web streaming, while the sprint race will start at 16.00 and will be shown recorded on Rai Sport 2 at 17.20. Race two will be replayed on Monday on Rai Sport 2 at 20.30.